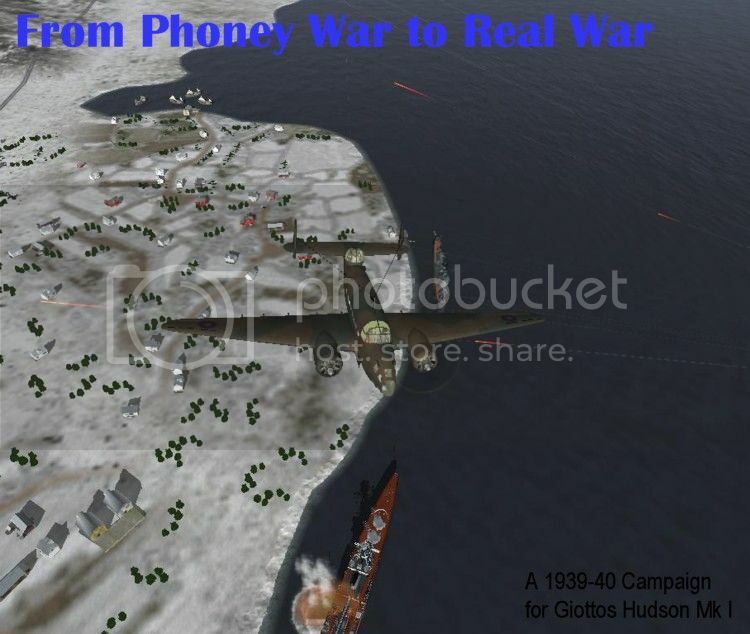 I have made a campaign for Giottos GREAT new Hudson! 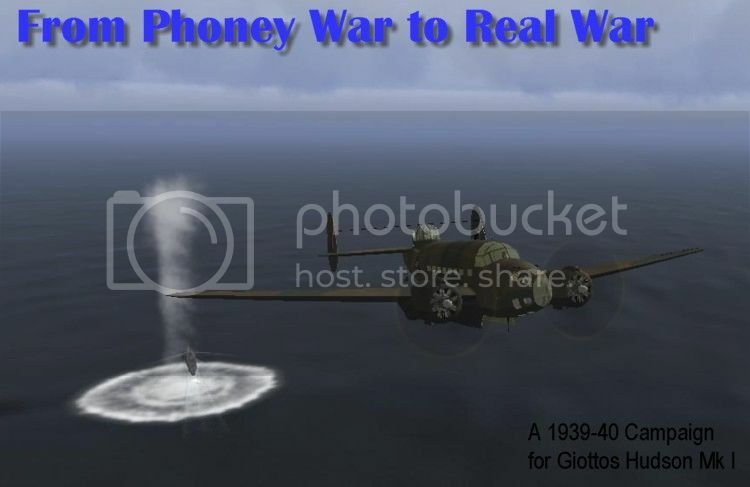 It is called "From Phoney War to Real War". 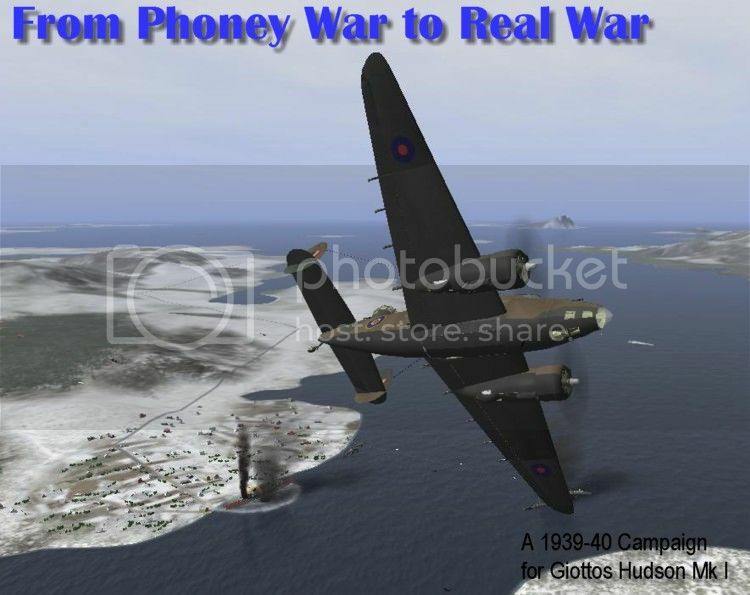 It is a 12-mission static campaign portraying the activities of a RAF Coastal Command Squadron during the period from the winter of 1939 to the early summer of 1940, starting with the so called Phoney War, were you are called upon to do lengthy patrols over the North Sea, over the Norwegian campaign, to the fighting in the last phase of the Battle of France. There is a random element in ALL missions. Firstly in the familiar way that each mission comes in two versions, the game picking one of them by random. Secondly in that the campaign makes intensive use of the latest version of Checkyersix's Command and Control Mod: this means that things like the opposition (number and skill), the weather, the time of day is randomized, etc. You can never be sure what you will meet or what will happen. This means that sometimes your mission will be completely uneventful - just like in real life! And if you replay the campaign it will of course not turn out the same again. The operational history of the Hudson was more varied than one thinks. No.244 Squadron had been the first to receive the new aircraft, in May 1939. 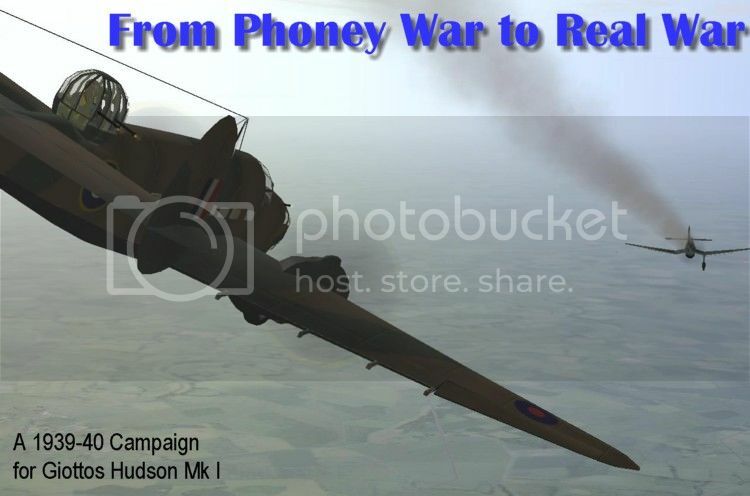 By September another Squadron, No.233, was also of converting to Hudsons, together with a third squadron, No.220, based at RAF Thornaby in North Yorkshire. 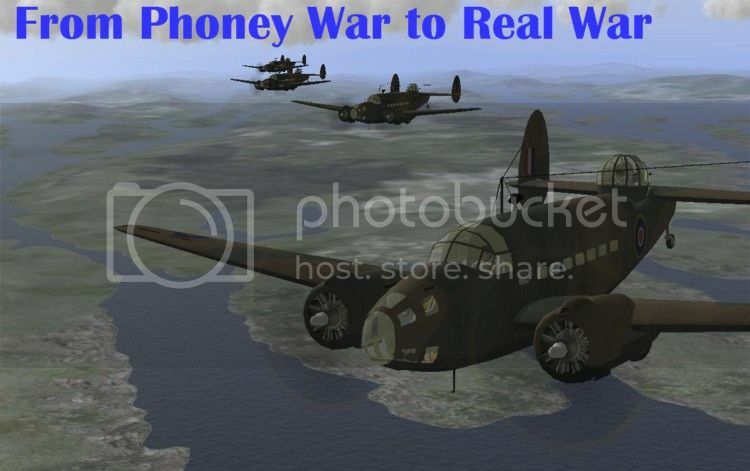 The RAF went onto a war footing on 24 August 1939. No.244 Squadron began to fly patrols over the North Sea, and on 4 September 1939 a Hudson of No.224 Squadron became the first RAF aircraft to have combat with the Luftwaffe, after an inconclusive fight with a Do.18. Two months later, on 10 November, two Hudsons from No.220 Squadron became the first Coastal Command aircraft to shoot down a German aircraft: a Do.18 of K.Fl.Gr.406. During the first year of the war the Hudson would have the best sortie to loss ratio of any front line RAF aircraft, probably because its main opponents during that period were pretty obsolete Do.18 and He.115 floatplanes. For most of the first year of the war the Hudson was used for its original general reconnaissance purpose, flying wide ranging patrols over the North Sea from east coast bases, skirmishing with German aircraft performing similar duties, attacking German shipping och U-Boats, when found. Hudsons played an important role in the so called Altmark incident. The German ship was first discovered by Hudsons of No.220 Squadron, and on 16 February it was a Hudson of No.233 Squadron which found the Altmark in Norwegian Fjord, allowing the destroyer HMS Cossack to board the Altmark and free the prisoners. And once the German invasion of Norway started in April 1940 the original three squadrons (Nos.220, 224 and 233) would be heavily engaged over Norway. Their Hudsons were in action on almost every day of the campaign, carrying out a mix of their normal anti-shipping duties and night bombing missions on German targets on land. For the following two years at least one Hudson squadron would always be involved in attacks on German shipping on the Norwegian coast. Nos.206 and 220 squadrons were eventually moved south to help cover the beaches of Dunkerque during Operation Dynamo. Although their main job was to keep the German E-boats at bay, both squadrons would actually claim aerial victories! On 1 June No.220 Squadron shot down three Ju 87 Stukas, but on 3 June No.206 Squadron did even better, catching a formation of Bf 109s in the process of attacking a patrol of Blackburn Skuas and shooting down three of the German fighters. 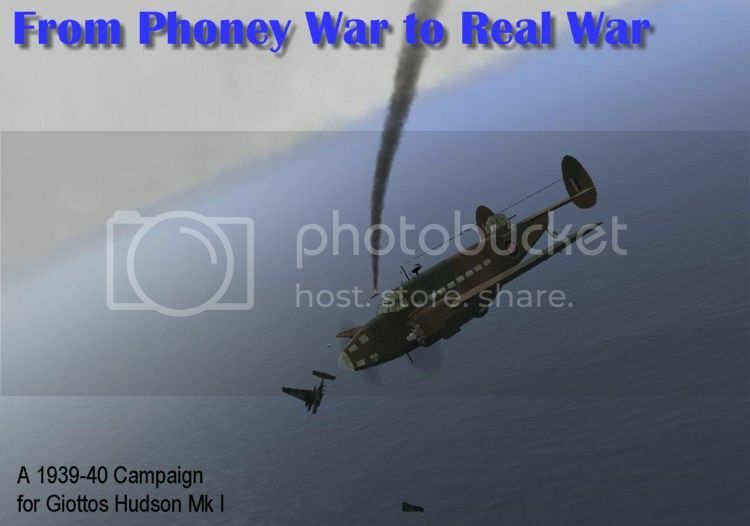 In the campaign I have tried to give the player a chance to try his hand at all these different types of action, at these different parts of the war.